Extraordinary Rendition is on sale for the month of October, for only $0.99! Get it on Amazon here. When Ali Hussein, suspected terrorist and alleged banker for Al Qaeda, is finally transported from Guantanamo Bay to the US mainland to stand trial, many are stunned when Byron Carlos Johnson, a pre-eminent lawyer and son of a high-profile diplomat, volunteers to represent him. On principle, Johnson thought he was merely defending a man unjustly captured through rendition and water-boarded illegally. But Johnson soon learns that there is much more at stake than one man’s civil rights. Hussein’s intimate knowledge of key financial transactions could lead to the capture of—or the unabated funding of—the world’s most dangerous terror cells. This makes Hussein the target of corrupt US intelligence forces on one side, and ruthless international terrorists on the other, and puts Byron Carlos Johnson squarely in the crosshairs of both. 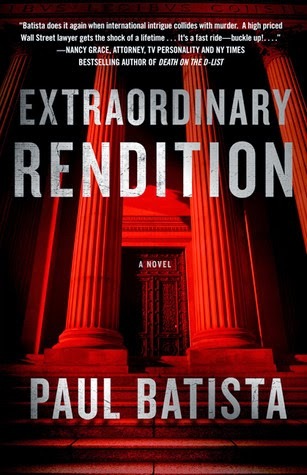 Written by no-holds-barred attorney Paul Batista, Extraordinary Rendition excels not only as an action thriller, but as a sophisticated legal procedural as well. Smart. Fast. Heart-pounding. A legal thriller of the highest order. I was completely addicted to legal and medical thrillers in college. I remember one summer when I would go to the library every week, come home with a stack of books, and read a full-length novel every single day. Social butterfly, I was not! That summer, I read all of John Grisham's novels, and quite a few novels by Scott Turow and other greats in the genre. I got quite burned out, and subsequently, I haven't read a legal thriller in a long time. I found myself quite looking forward to the change of pace with Extraordinary Rendition. I especially liked that Paul Batista is an attorney---his insider knowledge of the legal world lent this book a very authentic air. The premise of Extraordinary Rendition was really intriguing: a trial lawyer in the prime of his career at a prestigious law firm agrees to represent a man accused of money laundering for Al Qaeda. Byron, the attorney, thinks that Ali Hussein's case will be fairly simple. He soon learns that Ali and the web of law enforcement and secrecy surrounding him are anything but simple. I liked so many things about Extraordinary Rendition: the suspense, the plot twists, the characterization, and the conflict resolution were all very well-done. The entire book had a high-pressure feel to it: as Ali's lawyer, Byron's life is at stake, right along with Ali's. Every aspect of his personal life and professional life is affected by this case, and he can't trust anyone. I liked the way Batista wrote Byron: he was nuanced and flawed and very likable. The other characters were very well-developed; which I appreciated. I had a couple of complaints about this book---no deal-breakers, but little things that bothered me. First, Batista calls the characters by their full names at least 50% of the time. Instead of saying "Byron...," he says, "Byron Carlos Johnson...". This got old for me. I kept thinking, "I already know his full name, stop saying it so much. I've got it already!" My second complaint is that the ending was rushed. For such a long book, with such a big build up to the finish, I wanted more details to the ending. Looking back, I think that Batista may have shortened the ending to show the reader that the focus was not on how Byron's life ends up, but rather the heinous acts committed by US government officials in the name of anti-terrorism. Overall, I really enjoyed Extraordinary Rendition. It's a well-researched, well-written book, and one that I would recommend to fans of legal thrillers. It's such a relevant story for today's times, and made me rethink my views on terrorism and our country's treatment of suspected terrorists.